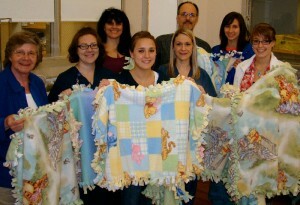 OSWEGO, NY – Members of the Oswego High School Interact Club recently donated a number of blankets to the Oswego Hospital Maternity Department. Students did fundraising to purchase materials, and working in collaboration with the Sunrise Rotary Club, created blankets for newborns. Making the presentation at Oswego Health for the â€œBlankets for Babiesâ€ project are (left to right) President of the Sunrise Rotary Club Sharon Baker, Pediatrics Nurse Gina Kristiansen, Sunrise Rotary Club Program Coordinator Lisa Shaw, OHS Interact Club Secretary Jordan Mangano, Pediatrics Nurse Kristin Conger, OHS Interact Club advisor Warren Shaw, OHS Interact Club President Katie Abramski, and OHS Interact Vice President Jillian Doty.